Do you like things that are dark and merry? Gothic thumb rings might interest you. The word "Gothic" refers back to the infamous Goth tribes that terrorized Europe during the days of the Roman empire. Goths were considered barbarians who were responsible for a lot of death and mayhem. Since then, the term has also been applied to certain kinds of architecture, literature and fashion, and it always seems to convey a rather dark and slightly sinister connotation. Today, Gothic style remains popular, fueled by images of Ann Rice's famous vampire tales, as well as music industry icons like the band Evanescence. Goth fashion is dark, featuring a lot of black and gray, with the occasional rich jewel tone thrown into the mix. Styles range from "Punk Goth" with lots of jeans, T-shirts and leather to fanciful 18th century period clothing that would make Lestat himself proud. Hair and makeup are also subject to the Gothic touch. Black, Byronesque locks, pale skin and deeply kohl-lined eyes give modern Goths their classic ethereal look. Once the fashion and cosmetics come together, it's time to complete the Gothic look with some signature rings. As you might surmise, thumb rings are meant to be worn on the thumbs, although a similarity in finger size makes it possible to wear these rings on index and middle fingers as well. Originally, thumb rings were worn by archers to protect their thumbs from the bow string. Early thumb rings were usually made from leather, but eventually a variety of metals were used to create heavy, ornate pieces of jewelry. Modern Goths wear thumb rings today to accentuate their overall fashion. Favorite styles include jeweled Gothic thumb rings with secret compartments that would have held potions in the old days, and ruby rings with points meant to prick the flesh. Silver is nearly always the metal of choice for the main body of these rings. In keeping with the slightly gleeful, yet sinister undertone of this fashion subculture, Gothic thumb rings combine amazing artistry with horrific images. "Children of the night", as they are lovingly referred to by Goth enthusiasts, have long symbolized a connection with the undead. The cross imagery used in Gothic thumb rings is directly inspired by Gothic architecture. Most crosses are heavy, and almost overburdened with detail, but that's what makes them so fascinating. You can look at them over and over, and still find something intriguing about them. Coffins represent death, a central theme in Gothic subculture and one that is embraced with a resigned welcome. Death isn't viewed as an ending, just a closer union with the shadowy creatures that lurk around the periphery of mortals. You must be familiar with the dark robed specter and the steely scythe he uses to cut souls away from flesh. The Reaper is a rock star in Goth terms. 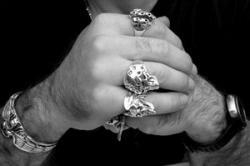 Not just for bikers anymore, skulls have exploded in popularity over the last few years. In fact, they've been overexposed really. No longer quite so cryptic, you can now purchase smiley skull and crossbones accessories at every Claire's Boutique across the country. Perhaps it's time to give this pirated Gothic theme a rest? No Goth ensemble is complete without at least one pentagram thumb ring. The pentagram is a five pointed star within a circle that is best recognized for its alleged use in conjuring magical spells. 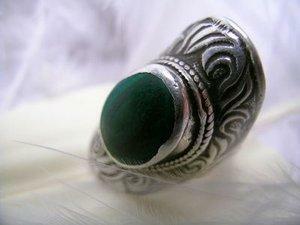 Demons and devil faces are more examples of extremely popular imagery found on Gothic thumb rings. What conveys a feeling of horror more effectively than the grinning face of a malevolent spirit? Although gargoyles are actually supposed to ward off evil spirits, they look awfully menacing in their own right. Yet another example of imagery borrowed from Gothic architecture that makes a truly imposing thumb ring. So, now you may know a little more about Gothic style and fashion. Are you repulsed, oddly fascinated or perhaps a little of both? Good. That's what Goth is all about.